A proposed road to private property north of Edwards must be approved by the U.S. Forest Service before construction can start. If the road is approved, owners of the 680-acre parcel intend to build 19 homes on large lots. EAGLE — After talking about potential fire dangers for 2018 and other White River National Forest topics, last week the Eagle County commissioners and officials from the Eagle Holy Cross Ranger District briefly discussed the controversial Berlaimont project at Edwards. Berlaimont Estates is a 680-acre parcel of private property surrounded by U.S. Forest Service lands, located north of Edwards and west of the Berry Creek drainage. Owners Petr Lukes and Jana Sobotova have proposed 19 units and nine accessory units on 35-acre or larger parcels in the area. The proposed development is classified as a use by right under Colorado law. Residential lots that equal or exceed 35 acres in size are exempt from subdivision regulation, and no public hearings about the land-use part of the proposal were required. But the location of the property has launched a public process through the U.S. Forest Service. Because Berlaimont is an in-holding, the developers must build an access road through Forest Service land. 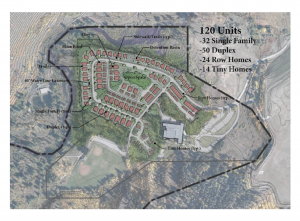 The road development requires an environmental impact statement from the Forest Service, as well as a formal determination regarding whether the proposed 19-unit residential area is a “reasonable” use. Eagle-Holy Cross District Ranger Aaron Mayville noted the Forest Service has deemed the proposed use as reasonable. “I acknowledge it’s not a very popular decision and will continue not to be,” he said. However, after extensive study, Mayville said the Forest Service believes its determination is the strongest action from a legal standpoint. The comment period for the draft Berlaimont EIS recently concluded. Mayville said more than 700 comments were received and staff is now compiling the information. One of the comment letters came from Eagle County. The commissioners said their letter was intended to address the social and environmental issues regarding the Berlaimont road. “Whether people agree or disagree, we want to know what they think about this,” Mayville said. He noted the Forest Service plans to issue its final EIS and draft decision regarding Berlaimont this fall.